"Cozad" redirects here. For the Kiowa drum group, see Cozad Singers. Cozad is a city in Dawson County, Nebraska, United States. The population was 3,977 at the 2010 census. The town is on the Great Plains of central Nebraska, along the Union Pacific Railroad and U.S. Highway 30, just north of the Platte River. The 100th meridian, which roughly marks the eastward boundary of the arid plains, passes just west of the town as is marked nearby on a prominent sign across U.S. Highway 30. In the early 1860s, it was a stop along the Pony Express. Cozad is part of the Lexington, Nebraska Micropolitan Statistical Area. 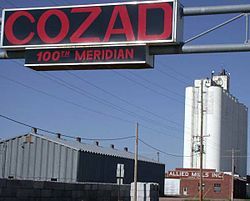 Cozad was founded in 1873 by John J. Cozad, a native of Ohio, and father of painter Robert Henri. He purchased 40,000 acres of land from the Union Pacific Railroad and laid out the future town. He build houses on some of the land to entice people to settle. He sold off most of the land to future residents who named the town after him. Cozad also founded Cozaddale, Ohio, a small, unincorporated village 25 miles northeast of Cincinnati. Cozad is located at 40°51′44″N 99°59′3″W﻿ / ﻿40.86222°N 99.98417°W﻿ / 40.86222; -99.98417 (40.862141, -99.984082). According to the United States Census Bureau, the city has a total area of 2.62 square miles (6.79 km2), all of it land. As of the census of 2010, there were 3,977 people, 1,656 households, and 1,058 families residing in the city. The population density was 1,517.9 inhabitants per square mile (586.1/km2). There were 1,881 housing units at an average density of 717.9 per square mile (277.2/km2). The racial makeup of the city was 92.4% White, 0.4% African American, 0.4% Native American, 0.3% Asian, 5.2% from other races, and 1.3% from two or more races. Hispanic or Latino of any race were 13.3% of the population. There were 1,656 households of which 33.1% had children under the age of 18 living with them, 47.8% were married couples living together, 10.3% had a female householder with no husband present, 5.9% had a male householder with no wife present, and 36.1% were non-families. 31.6% of all households were made up of individuals and 15.4% had someone living alone who was 65 years of age or older. The average household size was 2.35 and the average family size was 2.92. The median age in the city was 39.3 years. 26.2% of residents were under the age of 18; 7% were between the ages of 18 and 24; 24% were from 25 to 44; 24.9% were from 45 to 64; and 17.8% were 65 years of age or older. The gender makeup of the city was 48.5% male and 51.5% female. As of the census of 2000, there were 4,163 people, 1,722 households, and 1,127 families residing in the city. The population density was 2,007.2 people per square mile (776.5/km²). There were 1,851 housing units at an average density of 892.5 per square mile (345.3/km²). The racial makeup of the city was 93.39% White, 0.17% African American, 0.43% Native American, 0.43% Asian, 3.82% from other races, and 1.75% from two or more races. Hispanic or Latino of any race were 10.95% of the population. There were 1,722 households out of which 32.0% had children under the age of 18 living with them, 52.6% were married couples living together, 8.9% had a female householder with no husband present, and 34.5% were non-families. 30.4% of all households were made up of individuals and 14.7% had someone living alone who was 65 years of age or older. The average household size was 2.37 and the average family size was 2.95. In the city, the population was spread out with 26.4% under the age of 18, 7.8% from 18 to 24, 27.0% from 25 to 44, 22.2% from 45 to 64, and 16.6% who were 65 years of age or older. The median age was 37 years. For every 100 females, there were 92.8 males. For every 100 females age 18 and over, there were 90.8 males. As of 2000 the median income for a household in the city was $32,392, and the median income for a family was $43,413. Males had a median income of $27,217 versus $20,089 for females. The per capita income for the city was $18,139. About 9.8% of families and 12.1% of the population were below the poverty line, including 17.1% of those under age 18 and 11.3% of those age 65 or over. Robert Henri, American painter of the Ashcan School, was the son of John J. Cozad. His boyhood home the Robert Henri Museum is open to the public in the summer months. ^ Bowman, J. R. (1882). Shearer, Frederick E. (ed.). The Pacific tourist. J.R. Bowman's illustrated transcontinental guide of travel from the Atlantic to the Pacific Ocean. New York: J.R. Bowman. p. 38. OCLC 752667534. Retrieved 15 May 2018. ^ Fitzpatrick, Lillian L. (1960). Nebraska Place-Names. University of Nebraska Press. A 1925 edition is available for download at University of Nebraska—Lincoln Digital Commons. ^ "Cozad, Dawson County". Center for Advanced Land Management Information Technologies. University of Nebraska. Retrieved 4 August 2014. ^ The History of Warren County, Ohio: Containing a History of the County ; Its Townships, Towns. W.H. Beers & Company. 1882. p. 618. ^ "US Gazetteer files 2010". United States Census Bureau. Archived from the original on January 24, 2012. Retrieved 2012-06-24. ^ United States Census Bureau. "Census of Population and Housing". Archived from the original on May 12, 2015. Retrieved October 18, 2013. ^ "Annual Estimates of the Resident Population: April 1, 2010 to July 1, 2012". Retrieved October 18, 2013. This page was last edited on 7 March 2019, at 10:30 (UTC).